Last weekend, I had the awesome opportunity to work with EdMarket! Every year, they host an EdExpo full of hundreds of educational products. This year, they invited about 50 bloggers to browse and give teachers’ perspectives! Believe me when I say this room went on… and on… and on. 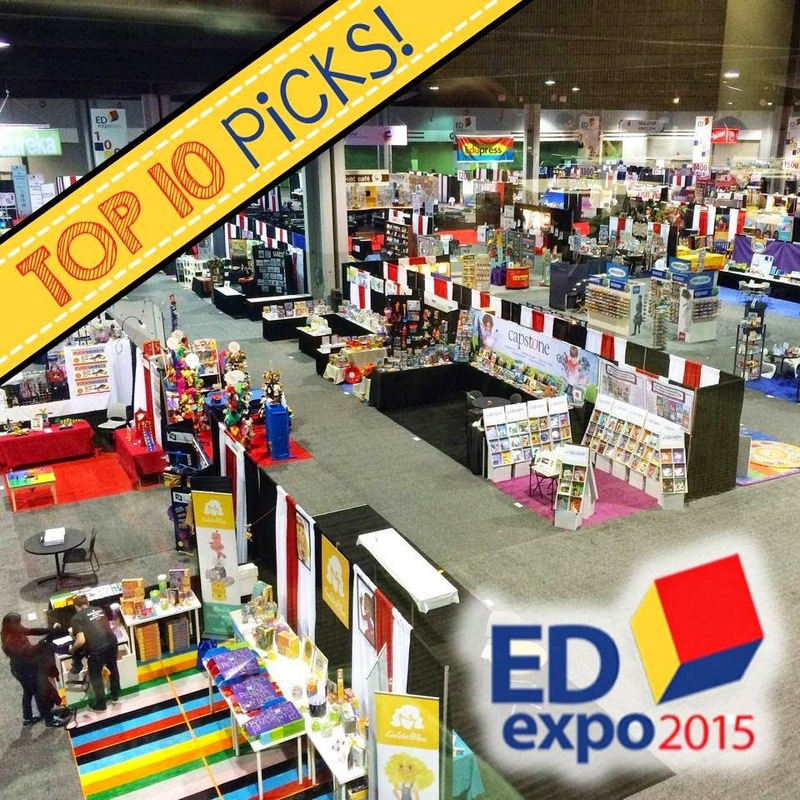 It was a whirlwind, but I found some amazing things you’ll want for your classroom! I’ll share MY top ten with you soon, but all of the 2015 EdExpo bloggers compiled our Top Ten lists, and today I’m going to share them with you! I have to say- I was pleasantly surprised to see a number of companies aiming to give kids creative outlets and hands-on, play-based learning! These blocks are great in that they can be used simply- or, as you can see, used for some intensely innovative designs. Electricity is always so fun to teach- but sometimes getting materials that are safe, fun, and durable can get to be very expensive. This set from Science Wiz teaches kids about circuits through puzzles, and the light-up factor makes them super engaging! I was completely and totally in love with this set. The inventor took her love of paper crafting and combined it with her science and engineering passions, and came up with THIS. Using LED stickers (yes, STICKERS!) and copper tape, kids can create nearly flat circuits. It was so unlike anything I’d ever seen, and so perfect for learning about electricity! The wide array of grips this company had just blew me away. I loved seeing the different fun, squishy, sensory-friendly grips they had for every stage of writer! Don’t you love finding a product created BY a teacher? These math bands help your students with skip-counting and multiplication. They simply start at the star and count around. Working on 7’s? Touch the star and then count 4 times to get to 7x4. Have you ever struggled to get your students to connect one unit of math to the next? This open number line allows you to add to it through the year so students can see that 1/2 is the same as 0.5 and also the same as a visual fraction. I love that there are versions for different grade levels, too! Known for making engineering girl-friendly, GoldieBlox makes a ton of innovative, creative kids’ toys with an engaging literacy component and LOTS of hands-on fun! The class set would be perfect for getting your kids creating and engineering- I would LOVE to have this in my science classroom! Boinks Fidgets from Endless Possibilities, Inc.
You can see from the booth (and the host’s amazing earrings!) just how much FUN this company is. What I loved most were the fidgets (see the close-up top right). The woven plastic tube is sealed on both ends with a marble inside. I found myself fiddling with it the whole time we talked- without even thinking about it! From the makers of Wordly Wise, a program for early vocabulary development. The game element keeps kids motivated, but the way this game fosters success with a few words at a time would make it especially powerful for those struggling readers in your room. Have you ever wished iPad learning didn’t outright replace hands-on learning? These letters are an amazing way to do BOTH. These magnetic letters work hand-in-hand with the Touchtronic app, and as kids place the letters on the iPad screen, they can hear the sounds they make. Self-checking? Yes. Independent? Yes. Surprisingly affordable? YES! So, where can you find these awesome products? Many of them can be found in local teacher stores near you- especially those that are part of EdMarket. You can search HERE to find a teacher store near you – perfect for checking it out in person before you buy! I am really grateful to EdMarket for letting me see some of the fantastic new products in education today, and I can’t wait to share more with you about my favorites! Which product would you be most excited to try in YOUR classroom? All this stuff looks great. I'm pretty jealous I could go--guess I'll have to save my personal days for this next year.